Mistresses who have mastered the basics of embroidery a cross, don't stop looking for new schemes or create your own, carefully taking the paper conceived patterns. Coming to the rescue of numerous programs for embroidery. Soft for the needle allows you to convert a schema in any of the images, including copyrights. Picture embroidered cross on a exclusive scheme, is a worthy decoration of the interior or an original gift. - supported formats .xsd .pat. It is easiest to download the program for an embroidery in the Internet, the more you will be able to try several programs and choose the one which will be most convenient and clear. Open any search engine. In the search box enter the phrase "Download software application for embroidery cross." In different tabs, open the websites of the developers of software for embroidery. Read the announcements to the software. Pay attention to the programmes and ensure that data formats are installed on your computer. The most popular and affordable software for embroidery cross is EmbroBox. Download this programunless you are first faced with the need to chart for embroidery and want from the start to make all qualitatively. In addition to convert images in scheme, the program picks up the shades of the threads, calculates their length, determines the size of the future drawing. 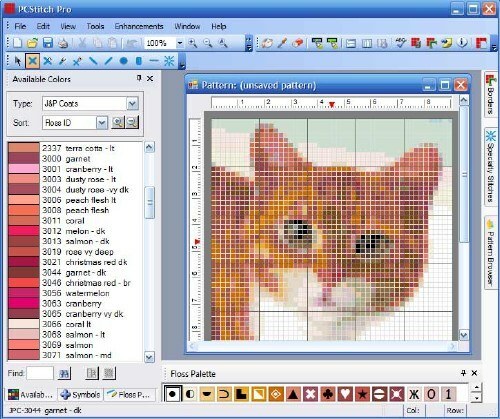 To download the program for embroidery Pattern Maker for Cross-Stich, make sure that your computer supports the expansion .xsd. This program is not only convenient for the transformation of the image schema, but also to display charts on the monitor. Using the Pattern Maker to edit colors and select stitches. Download program for embroidery PCStitch, it is similar to the previous program, but the generated files are not compatible between them. This software supports the extension .pat, if you habitually work in this format, select PCStitch. Software for embroidery Stitch Art Easy is so simple that you can easily master her skills with graphic editors. Simplify the original schema, this is the perfect thread, export the pattern using Microsoft Excel. To work with the program for embroidery will help you clear clues in Russian language.